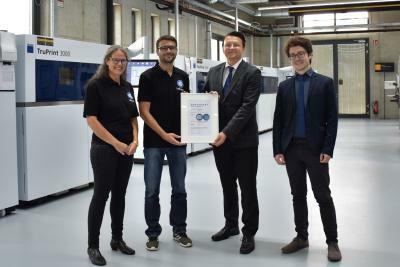 In July this year, Toolcraft became a member of the German Aerospace Industries Association (BDLI), which is itself a member of the Federation of German Industries (BDI). 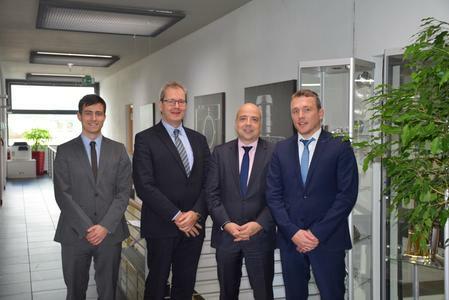 The company was recently visited by the Director General of the BDI, Dr. Markus Kerber, and the Managing Director of the BDLI, Mr. Volker Thum. The focus of the visit was additive manufacturing. This production process has become a well established manufacturing technology in virtually all sectors over the last few years. Work on developing a certified process is also well under way in the aviation and aerospace industries. Initial introductions were followed by a brief presentation of the company that focused on production methods using metal laser melting. Toolcraft Managing Director Christoph Hauck then gave his high-profile guests a tour of the Georgensgmünd production halls. This tour included the new M2 multi-laser machine, which uses two lasers in production rather than the single laser used in previous models. It can also be used for integrated process monitoring. This boosts output and also improves the quality of products as well. During the tour, the host and participants shared information regarding upcoming developments in this field. Opportunities for further collaboration were also discussed. 'The BDI and the BDLI exert a great deal of influence within the industry. 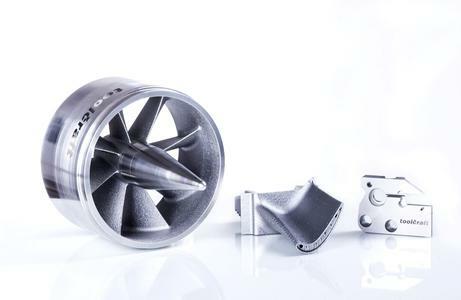 Collaborating with them will make it possible to develop additive manufacturing into a certified production technology,' says Christoph Hauck. The BDI looks back over a long history. It was founded in 1949, the same year that the Federal Republic of Germany was established, and played a key role in the country's successful transformation into a major industrial force. As the umbrella organisation for industries in Germany, the BDI now represents 36 different industry associations and thus the political interests of over 100,000 companies. The BDLI is one of the BDI's member associations. It acts in the political interests of over 220 companies in the aviation and aerospace sector. The industry has gained major importance in Germany, as a result of technological innovations and international success. As a supplier of components for the aviation and aerospace industry, Toolcraft has been a member of the BDLI since July 2016. 'It is amazing to see the complex geometries than can be produced using this process,' says BDI Director General Dr Markus Kerber. 'The reduction in weight that the technology allows makes it particularly useful in aviation and aerospace,' adds BDLI Managing Director Volker Thum. As a partner of engineers of almost all industrial sectors Toolcraft manufactures precision parts, assemblies, moulds and injection moulded parts. Industries are for example the semiconductors, optical industry, special machinery manufacturing, motor sports and automotive, medical technology as well as the aerospace sector. Thereby Toolcraft values long-term business relationships. Part of the corporate philosophy is an intensive cooperation with partners, such as Unicam Software GmbH, YPTI Indonesia, Concept Laser GmbH. Therefore Toolcraft is able to offer technologically and economically convincing holistic solutions in the shortest possible time.